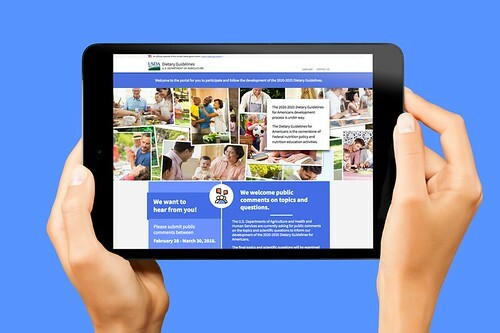 Visit DietaryGuidelines.gov to learn more about the process of developing the DGA. Coinciding with the beginning of National Nutrition Month®, we are excited to announce, along with our partners at the U.S. Department of Health and Human Services (HHS), a new step early in the process to develop the 2020-2025 DGA. For the first time, USDA and HHS are posting for public comment the topics and supporting scientific questions to be examined at the start of the DGA development process. The public comment period will be open until March 30, 2018. This important, new step reflects our continued commitment to ensure that the DGA development process is transparent, inclusive, and science-driven – and to incorporate recommendations and feedback on the process received from stakeholders. Transparency and customer service are among the key tenets that guide our decisions at USDA. The American taxpayer is an essential customer – indeed, a shareholder. We are proud to take this important step forward toward greater transparency and ensure that the American public’s voice is heard throughout this process. Life stage approach: USDA and HHS are proposing a life stage approach for this edition of the DGA, focusing on priority scientific questions from birth through older adulthood. This approach is a new opportunity due in part to audience expansion, per the 2014 Farm Bill, which mandated that starting with the 2020-2025 edition, the DGA provide guidance for women who are pregnant, as well as infants and toddlers from birth to 24 months. Criteria: The topics USDA and HHS are posting for public comment for the 2020-2025 DGA are based on four criteria: relevance (topic is within scope of the DGA and its focus on food-based recommendations, not clinical guidelines for medical treatment); importance (topic for which there is new, relevant data and represents an area of substantial public health concern, uncertainty, and/or knowledge gap); potential federal impact (probability that guidance on the topic would inform federal food and nutrition policies and programs); and avoiding duplication (topic is not currently addressed through existing evidence-based federal guidance, other than the Dietary Guidelines). As we go through this multiyear process to update and publish the 2020-2025 DGA, it’s also important to note that as the Dietary Guidelines has evolved over the decades, it isn’t about focusing on individual foods or food groups. We are looking at what we eat and drink as a whole, and how that can help prevent diseases and keep people healthy. As you will see in the months and years leading up to the release of the 2020-2025 DGA, our process will include new approaches to provide the public with more transparency and opportunities to participate. We welcome your voice as we work hard to deliver on our continued commitment to our customers – you. You can find additional information on the DGA process at DietaryGuidelines.gov. Make your voice heard! Learn more about the DGA process at DietaryGuidelines.gov. Hope to see an emphasis on whole food plant based as more and more research is showing that animal products are not healthy for us. However it seems as if this is a lot like the whole smoking thing. Although the research was out there forever it took decades for the govt. and medical profession to finally admit that smoking at all is bad because of the powerful tobacco industry. This is comparable to the huge influence today that the meat and dairy industry have. I gave up added sugar and found it took a long time to not crave it, several years! No sodas, no sugared drinks or juices-- just coffee, tea, water. When I gave up eating pastries, cakes, processed crackers or bread made with white flour I had a huge change in the way I felt. My joint aches were eliminated almost immediately. I eat all sorts of nuts, more vegetables (at least one salad a day), protein that has not been cured/smoked/processed when possible, and fruit. My body feels well, I have plenty of energy, sleep well, and no one guess my age correctly. The intake of natural plant based vegetables, fruits , nuts and grain based food products should be form the major components of the menu across the age groups with soy milk and minimum sugar and animal fat to maintain good health and stature. The senior citizens should be considered as well. Consumption of alcoholics and tobacco should be discouraged. I want to see low carb. diet, keto diet, intermittent fasting listed as health promoting activities. It is time the Dietary Guidelines began to reflect the science. I truly hope to see them review the evidence on low carb high fat in its various iterations. I switched from an active job to a desk job and over the course of 2 years put on 20lbs. eating like I always had. After cutting out all refined grains, products with added sugars and the high starch foods and focusing on adding in more fats and whole vegetables I've had a huge turnaround. In 1 month I've lost 10lbs. My once to twice a week headaches have completely gone away, which I have had for nearly a decade at this point. The hunger pangs that preceded every normal meal time disappeared within about 3 days. My general appetite has been lower as well, enough that I seamlessly moved to an intermittent fasting window of 6 hours to eat, 18 hours fasting to take advantage of the benefits of autophagy. That ends my experiential portion next I wanted to find out why this sort of diet works so I went through all the research I could find on the diets in question and other diets. I wanted to find out what the evidence said. Specifically the randomized control studies which can track actual correlations where the epidemiological studies only appear to show loose associations to create the basis for deeper review. My general finding was that a majority of the issues run back to two root causes high insulin levels caused by high blood sugar, and high levels of inflammation do to the extremely high Omega-6 to Omega-3 ratio in the average person. The Omega-3 issue actually being the simpler of the issues to solve, the recommendations on what oils to cook with would have a large effect by adding fewer Omega-6's to the process, ex. coconut oil/butter and recommending either an Omega-3 supplement or more seafood focusing on seafood options low in mercury would be ideal. Better Omega-3 to Omega-6 ratios have long been associated with lower risks for a slew of diseases from cancer to cardiovascular issues to auto immune diseases. What are healthy sources of fats becomes the next question. When ignoring the epidemiological studies for the obvious problem that they show association and are meant to find data to determine a hypothesis to test, but lack the scientific rigor to show a level of correlation, the various randomized control trials on the subject continue to show no statistically significant effects from raising or lowering ones saturated fat intakes on heart disease or all cause mortality. Given that lack of correlation on saturated fats and the high degree of correlation between high insulin levels cause by prolonged excess glucose levels the safe move appears to be less processed carbs and sugars and more fats for the general population. Estimates vary, but approximately 2-5% of the US population is now identifying as either Vegetarian or Vegan. It would also be advisable when making the new guidelines to provide more targeted guidelines to address their unique health needs primarily focusing on the most common vitamin and mineral deficiencies such as Zinc, Iron, Choline, B12, DHA & EPA, Calcium, Iodine, and Magnesium and where specifically those deficiencies could come from and how to correct them via supplementation or through dietary adjustments to avoid the foods higher in anti-nutrients. This could be especially important for pregnant women who are vegan as there appears to be an association with low DHA & EPA levels with autism which does not appear to be correctable after age 2, also children with ADHD are highly likely to be low in DHA & EPA, Zinc, and Iron cause and effect relationship unknown. To be clear that last bit is an association and no correlation has yet been proven, but the consistency of the vitamin and mineral deficiencies is well known and common so adding some advice to help them stay healthy while maintaining their ethical stances would be a very important addition to the guidelines. I would like to participate, but I am Egyptian, can I? @Steve Honaker II - This public comment period is now closed. You can look at the revised list of topics and scientific questions (PDF, 477 KB), reflecting public and Federal agency comments. This list includes questions on low-carbohydrate and high-fat diets, types of dietary fats, and more. We encourage you to stay engaged in the process to develop the 2020-2025 Dietary Guidelines for Americans at DietaryGuidelines.gov. @Sara Elsaiedh - This public comment period is now closed. Currently, USDA and HHS are asking for nominations to the 2020 Dietary Guidelines Advisory Committee. The deadline to submit nomination(s) is October 6, 2018, midnight Eastern time. To submit a nomination, please visit the Checklist: How to Submit a Nomination page (PDF, 149 KB). 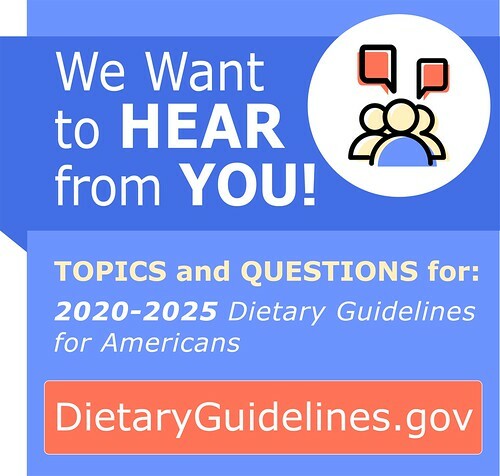 We encourage you to stay engaged in the process to develop the 2020-2025 Dietary Guidelines for Americans at DietaryGuidelines.gov. U.S. citizenship is not required for participation. I started a low carb diet about two years ago. I aim for ketosis but most likely don't stay in very long. My average net carb load a day I would estimate ranges from 30-50 g. In January, my LDL reduced significantly, HDL increased, and triglycerides decreased. My weight also reduced by 30 lbs. I take a high dose of fish oil on and off, but no other supplements. I'm a busy father or two (stressed), husband, and don't exercise regularly. I have an office job and I'm seated most of the day. My daily low carb breakfast consists of regular eggs fried and a breakfast meat (sausage or bacon). At this point the only thing I would change is exercise because this diet has worked for me. I believe there should be an in-depth study of low carb (meat based and/or plant based) vs other diets. If the findings are positive they should roll out to all schools, hospitals, etc. then deal with the public. This search has not been taken seriously by many and we need more of it. The use of the ketogenic diet in the treatment of cancer needs to be addressed. Cancer research specialists Lewis Cantley and Thomas Seyfield are getting amazing results in shrinking tumors, in several cases down to zero. A ban on added fructose and it's involvement with NAFLD, as researched by Robert Lustig, also needs to be strongly considered. Thirdly, the reversal of diabetes symptoms by use of the ketogenic diet, as demonstrated by Dr Sarah Hallberg at her clinic, Virta Health, also needs to be strongly considered, with her condemnation of sugar. Hello, my name is Adaobi Nwoka and I frequently visit Dietary Guidelines for Americans. It is with great pleasure to be given an opportunity to comment for the next dietary guideline cycle. We are currently living in a generation that glorifies social media and it plays a major impact on what we eat. As we begin to think about the next 5 years, we must emphasize the shift in eating habits as a result of technology/social media and how that applies to the social ecological model. In Chapter 3 (the introduction of the social ecological model), it would be worth giving examples for each bullet point under the categories (individual, settings, sectors and social and cultural norms and values) and how they play a role in our eating and physical activity habits. While the model makes sense to public health professionals, your general audience may not understand what that looks like. I think we need to emphasize that everyone plays a role in healthy eating habits. It is not a journey one must face alone. For example, grocery stores using promotional strategies to drive up vegetables and fruits sales or churches promoting healthy potluck events etc. It will also be helpful to provide tech-friendly tips for staying active and eating healthy in the appendix section. You need to remove the "fat scare" you have created all these years. I am on a ketogenic diet, high fat/moderate protein /very low carb. There is science after science (including NIH studies) that proves high (healthy) fats, moderate protein and very low carbs, fixes diabetes, inflammation, high blood pressure, fatty liver, assists with chemotherapies, assists with cognitive abilities with alzheizmers, and keeps the culprit of all our health issues ="insulin"... calm. Fat is the "other" fuel source (ketones) for our body instead of carbs. That's how you cure our diabetes epidemic in the US. You also need to get FRUTOSE off the market - it has DOUBLE the insulin affect on our bodies as regular sugar. This time do it based on "real" science . Get all animal product off the list of healthy foods. The research has been there for years. Get rid of the meat and dairy lobbyists. You all know the truth. Please quit deceiving the public in the name of $$$. Some of your healthy choice recipes look great, I think I may even have to try a few. Balancing out nutrition and making health choices in our students is important as they grow into young adults I am hopeful they will carry on this information and make good choices and healthy behaviors for their futures and continue to pass it on! People have done their research and are changing their diets because the low fat high grain diet has not worked. We are fatter and sicker than ever. There is no study that shows a correlation between fat and heart disease. The food pyramid needs to based on modern science.